The project “Seed of Knowledge” revolves around the main conceptual and design motive ‐ a deconstructed “Tree” with all its philosophical, biological and ecological characteristics. beliefs, the tree is connected with the notion of knowledge, while Celtic languages have the homonymy of the words tree and knowledge. version the seed “Tree” is defined inside the main tower. It is constructed out of elements from the deconstructed building in Carice Milice Street, reducing waste materials by upcycling. 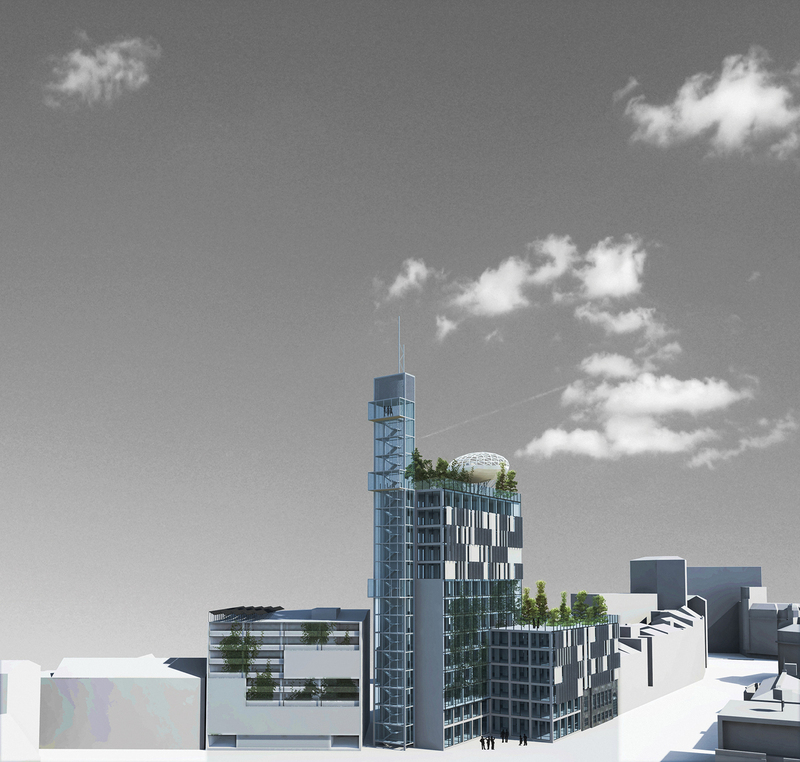 The “Tree” has its treetop – the seed, the house brain – the elliptical form on the top of the existing tower. The “Tree” has, as well, its root – elements going through the tower and ending in the first floor pointing that the soil of this tree is not the earth, but the building rising from the earth. This “Tree” is seeded from the outside nature into the building soil. In China, the tree is considered to be one of the five elements, and it corresponds to the East and Spring. Therefore, the “Tree” is placed in the eastern part of the building. 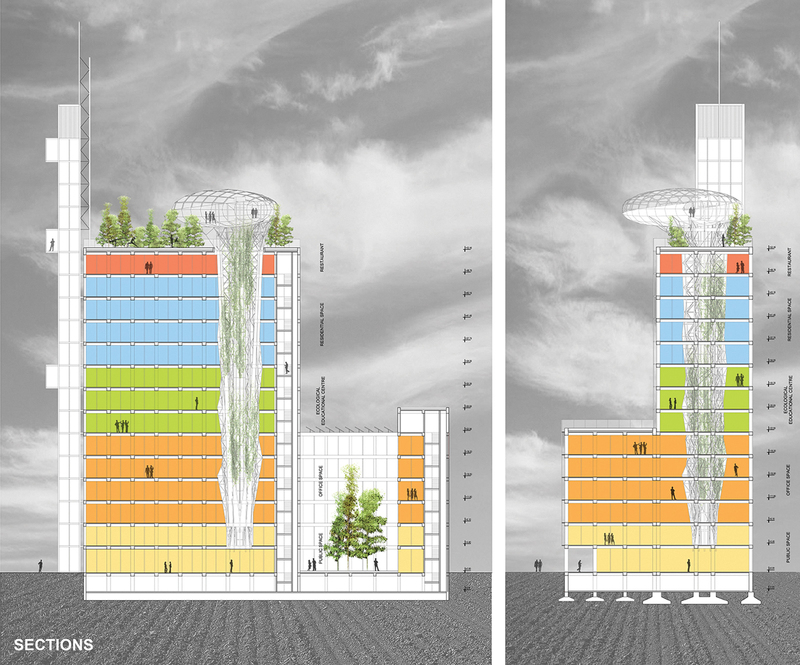 The “Tree” feeds itself from the outside/nature – it “eats” daylight distributing it along with solar energy to the rest of the building and “drinks” rainwater. The detailed description of its biological aspect will be explained in the section about sustainability and energy efficiency. The existing building had a “problem” regarding the use of asbestos that stopped the reconstruction in 2011. Therefore, the “Tree” symbolizes the central healing system of the building – creating heather and more pleasant atmosphere. 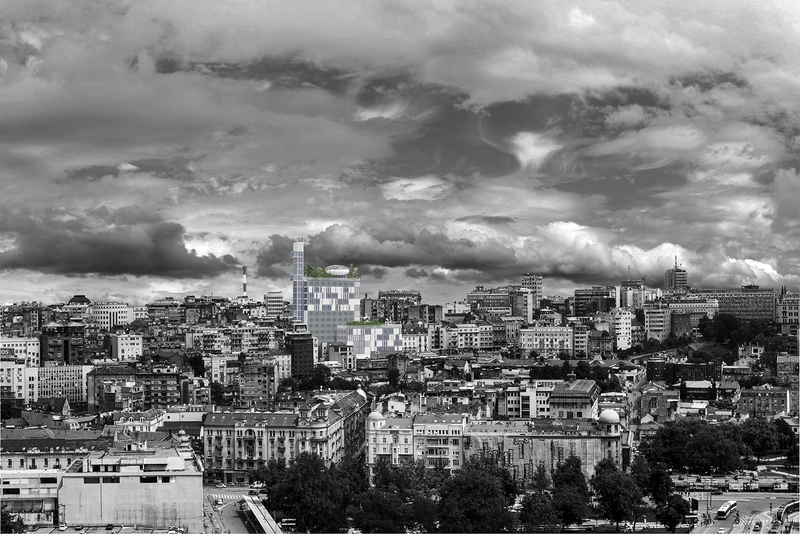 The design focuses on the maximal preservation of the existing construction. 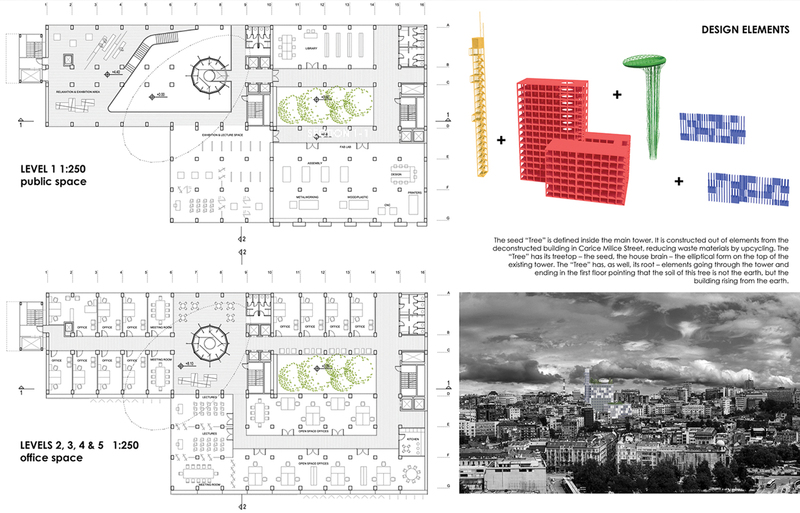 The towers’ primary construction system (beams, pillars, floor plans) as well as the construction system in annexes in Brankova Street remained with interventions regarding only new openings in floors and ceilings. The building in Carice Milice Street has been replaced with a new structure serving as large public garage. 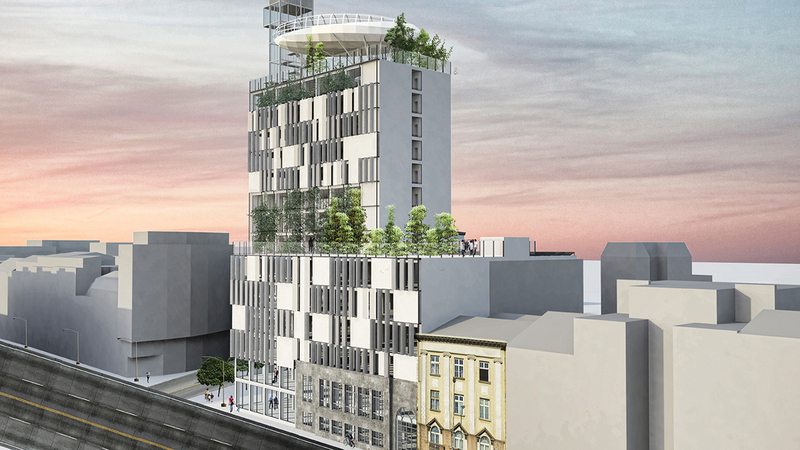 On the corner of Brankova and Carice Milice Street, a glass tower with a panoramic elevator is installed. It also provides access to public floors of the existing tower (levels of ecological educational Centre and restaurant). First six levels of the tower and its annexes form a unique joint space. Ground level and the first floor are public with the entrance hall, interactive permanent and temporary exhibitions, gift shops, bookstores, fab lab, lounge bar, etc. These functions along with communications occupy around 2500sqm. The main event in the building is the “Tree.” Therefore, the space around it is always public, while the visitors’ profile depends on the prevailing function on the current level. The second, to fifth floor are designed as office space forming both classical and open space offices with accompanying functions. Office space along with the communications occupies around 5200sqm. 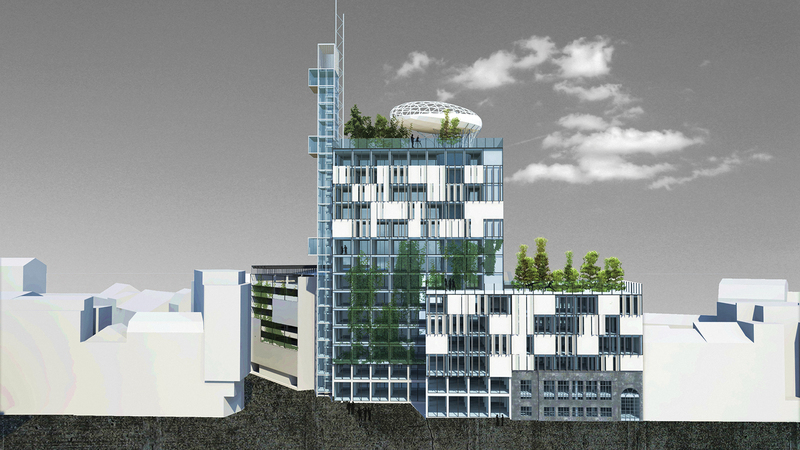 The next three levels (floors 6, 7 and 8) accommodate the ecological educational Centre. 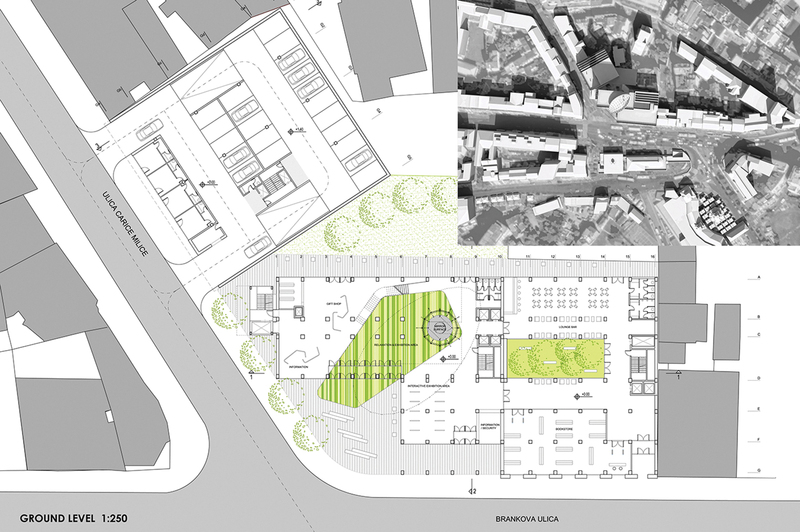 This space has lecture and projection rooms, small auditoriums, classrooms, ateliers, library, media room, workshop spaces, meeting points and rooms, cafés and the access to the roof garden on the top the annex. 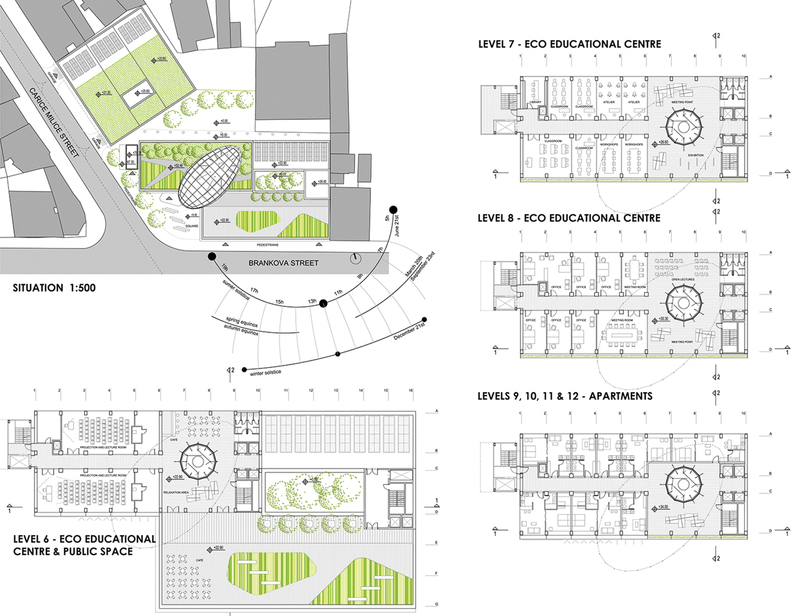 The ecological educational Centre with communications has around 1300sqm with 200sqm of different public spaces. The ninth, to twelfth floor of the existing tower has been designed for apartments (temporary rental). Apartments occupy approximately 2100sqm. The top floor of the tower is the restaurant with the panoramic view (around 520sqm with the communications). Accesses to the roof and the panoramic tower are given from this level. The ellipse standing on the rooftop can be described as a “seed” and can only be accessed with the elevator that escalates the “tree” root. The “seed” should be seen as a seed of knowledge – the brain of the house, and therefore it is meant to become a space where significant lectures regarding ecological issues and issues regarding sustainability and energy efficiency will be held. It is also a place where visitors can receive information about applied systems in the building through multimedia. The garage in Carice Milice Street has six underground levels, ground floor and eight floors about the ground with 535 parking places in total. The primary goal of this proposal was to achieve as much efficiency as possible using basic architectural design – passive systems. 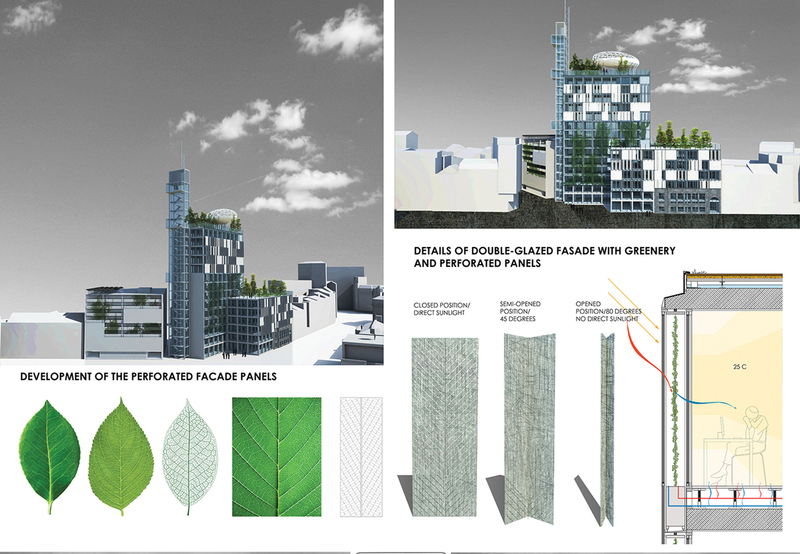 The façade is constructed as a double‐glazed glass façade with greenery in the area between glasses or perforated façade panels for the enhancement of passive design performances. The greenery of the tower’s double façade is used in places that correspond with the public areas. The double façade with perforated panels is used on the tower and its annexes focusing on the offices and apartment spaces for better control of daylight. During summer, Sun rays are reaching the façade. The greenery is cooling the air, and the panels are preventing warm air from entering the building. This process provides an optimal inside comfort and minimizes energy use for cooling. During winter, the panels stay open, and the seasonal greenery is gone. Out of that the opportunity for passive heating of the building through double‐glazed façade is created and energy use for the additional heating minimized. The façade panels are designed as stylized tree leaves – perforations are following leave veins. 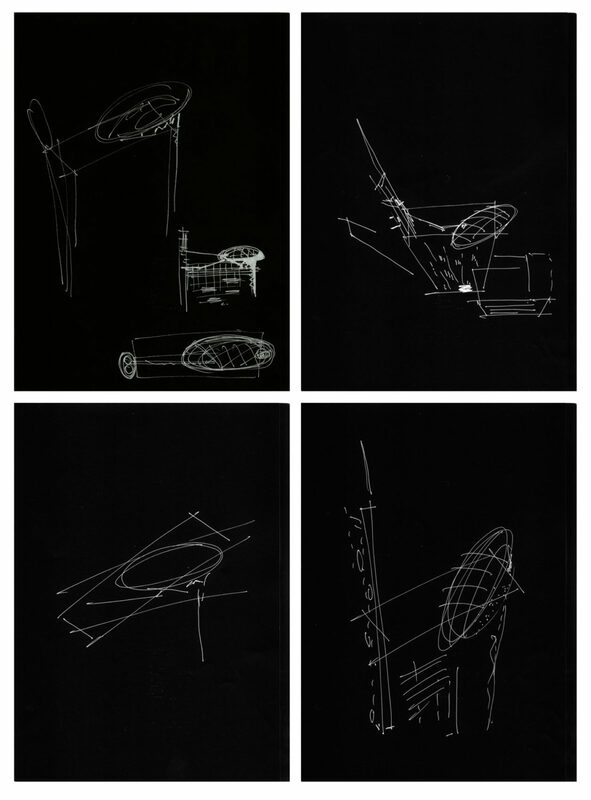 Their diameter and thickness depend upon the need for the daylight determined by the functional use of the inside space. These panels are part of a kinetic system that reacts to the amount of direct sunlight. The aperture of the system is connected to the angle of light. This kinetic system represents basic natural process. The main concept – the “Tree” is not just used as a symbolic manifestation of natural processes. It plays a major role in energy performance of the building. During summer, it functions as a natural ventilation and cooling system relying on the amount of greenery inside and its form and position in the building. During winter, the “Tree” is used as a passive glasshouse providing additional heating The atrium has a similar logic. It allows natural ventilation during summer and with its greenery prevents overheating. Due to the absence of greenery in winter additional sunlight can access the building. All of the rooftops contain greenery that produces additional isolation (prevention of roof overheating during summer and heat loss during winter). 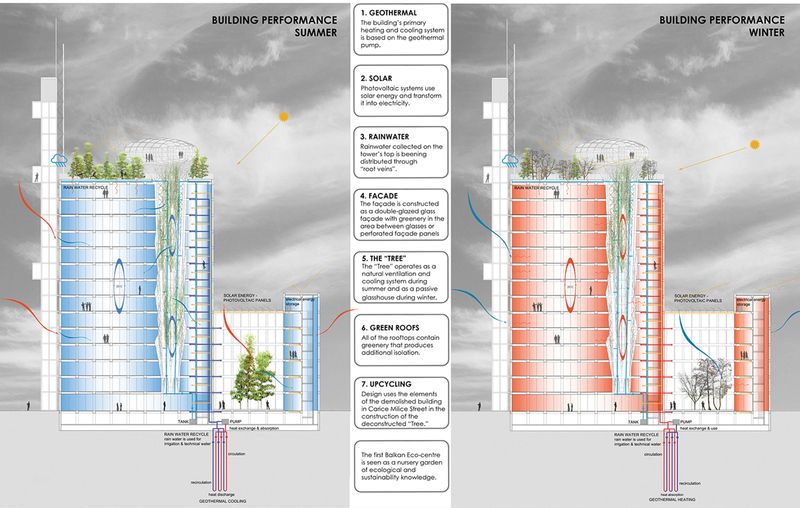 The building’s primary heating and cooling system is based on the geothermal pump. Geothermal pumps use geothermal energy from the soil. Their system is based on the fact that the ground temperature on 3m depth is constant and between 10 and 16 degrees. The system consists of a heat pump installed inside of the building, a channel for the circulation of water transmitting heat from soil to the building (or vice versa in the case of cooling during summer) and a subsystem for the distribution of heat energy in the object. Geothermal pump also controls the air moisture keeping it on the average of 50%. Its construction depends on the type of soil, but since a multi‐story building had already been built on the site, potential problems are minimal. Photovoltaic systems use solar energy and transform it into electricity. This project provides integrated roof photovoltaic systems that have the ability to store surplus energy and distribute it to other users as well. The photovoltaic system is placed on the rooftops in Brankova Street and on the garage in the Carice Milice Street to cover the most of the sun positions and maximize its performance. The “Tree” operates as a rainwater collector as well. 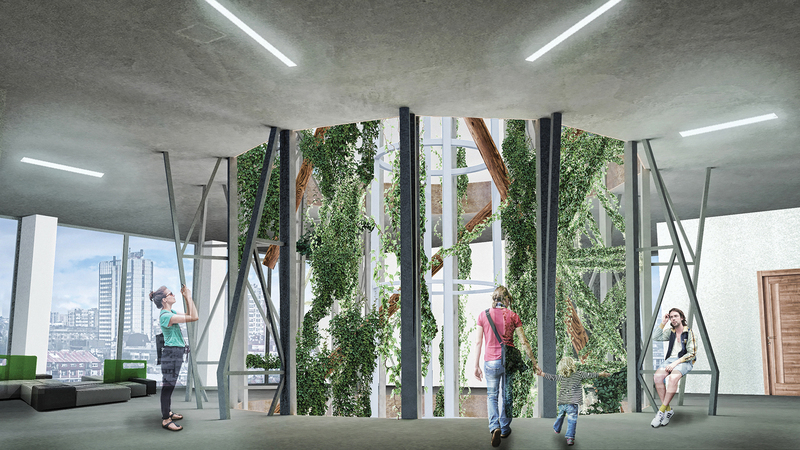 Rainwater collected on the tower’s top is beening distributed through “root veins” – deconstructed elements of the “Tree” – to the main tank in the basement level providing irrigation water for the plants in the “Tree” along the way. From the main tank, the water is afterward distributed further to the green façade and green roofs as technical water. Wastewater of the building is as well collected in the basement and used for the irrigation systems.